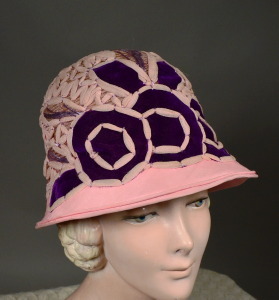 Pink 1920's vintage cloche hat with purple trim. Pink horsehair, pink silk georgette and deep purple silk velvet. High dome crown with concentrically stitched horsehair. Purple velvet stylized ART DECO roses & leaves applied center front with georgette "ribbon" outline. Georgette covered asymmetric narrow turn down brim. Applied georgette "ribbon" trim and lavender embroidery accents. Full iridescent silk lining. Crown height front - 5 1/4"
Brim width front - 1 1/2", back - 1/2"
Inner crown width from side to side - 7 1/2"
Inner crown length from front to back - 7 1/4"
EXCELLENT condition! Shows some light soil at brim edge, underbrim and tiny dot on crown back. Also shows small neat weave repair at lower crown.